This modern vacation rental condo has everything you need to enjoy your next trip to Park City! The studio living space features a queen bed, sleeper sofa, 1 bath, and room to sleep 4 guests. Enjoy access to a pool and hot tub and proximity to the Sundance Film Festival headquarters and Park City's historic Main Street. With a free city bus coming every 10 minutes, getting to and from home is easy. Explore local restaurants, nightlife, art galleries, and the spectacular Union Pacific Rail Trail! After a day of adventuring, come home and relax in this cozy condo retreat. Step out to the private balcony and take in your peaceful surroundings with a refreshing beverage. Spend downtime in this studio knowing that you'll have all your favorite options for TV entertainment at your fingertips. The brand new 55-inch 4K TV has access to Netflix, Hulu, other streaming sites, and completely free access to the NFL Season Pass for all those football fans; you'll never miss a snap! As dinner time approaches, head to the well-equipped kitchen and prepare a home-cooked meal. Load up your plates and find a spot by the coffee table or the small desk. Once dinner is complete, turn on the flat-screen TV and catch up on your favorite shows before retiring to bed. The cozy queen bed or sleeper sofa are the perfect places to rest up before another day of busy adventures! 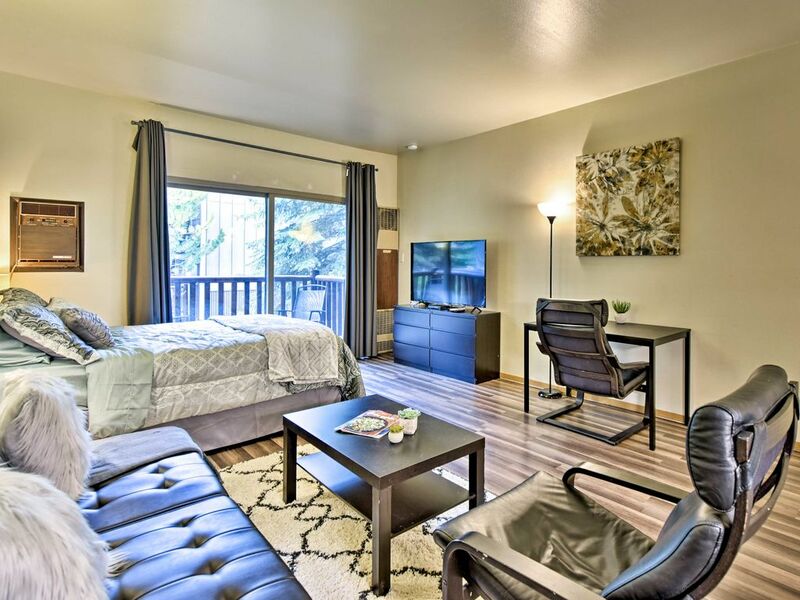 This condo is located in the Prospector Square area of Park City and provides amenities like a community pool and hot tub at the Silver Mountain Sports club. For $25 per day or a separate weekly rate, enjoy full access to all the equipment in this fitness center. A 2-minute walk leads you to the Prospector Square Theater, one of the theaters used for the Sundance Film Festival! Hop on the free city bus and, in less than 10 minutes, arrive at Park City's Historic Main Street. Indulge in the history of the area at the Park City Museum, peruse over 70 retail shops and galleries, or treat yourself to local restaurants and bars. A block away from home lies the Union Pacific Rail Trail. This 30-mile trail caters to bikes in the summer and transforms into a spectacular and scenic cross-country ski trail in the winter. Our host was very responsive and we greatly appreciated the flexibility with the check-in and check-out times. The unit was clean and functional with some interior updating. The location right on the bus line was very convenient-we had no problem getting around town. Also within walking distance to stores and restaurants in Prospector. It does have a washing machine but no dryer, however; we were able to make use of the hanging area to dry those items we washed. Overall good value for the price. Cute little home away from home. Jay our host was so attentive and willing to help. We would have liked the Tv to work a little more easily. It took several steps to get to direct tv and often times did not work And would love to have had paper towels and garbage bags supplied since we didn't have a car. Other than that the stay was perfect. Close to bus stop and a quick Uber to main street restaurants plus a sweet little view and quiet. PS. Bed super comfy! Small and cozy with a fantastic host! The space was the perfect size for our group and had a convenient location, so we could use public transportation to downtown, the ski hill, grocery store etc. The space was clean and the kitchen had everything we needed to cook meals. The check in process was easy and the host was amazing about checking in and responding if there was anything we needed. The condo was old and has never been updated. The owner was non-responsive before and during my stay. I called him twice and texted three times with no response. The television and the washer and dryer did not work; the bed was not stable; the towels and rugs were disgusting; and the place had an overall smell. I had to go to the store and purchase new towels, rugs and candles. If it wasn't for the fact that the place was already paid for, and it would have been hard to find another place during the Sundance Film Festival, then I would have tried another place. Potential clients beware of false advertising. The only good thing was the location. Other than that, it was a horrible place to stay. Update as of February 2019 - Hi Lorisa, the homeowner has let us know that the bed you mentioned has been replaced and now features an upgraded bed frame, box spring, and first-rate, top-quality mattress. The most recent guests reported that they slept beautifully, and we believe future renters will be extremely happy. As mentioned above, the owners would like to reiterate that they are available by text or call 24/7 for guests, and will keep no guest waiting longer than 30 minutes for a response. Lastly, every item in the unit is virtually brand new and works perfectly, but guests are always encouraged to reach out with any issues or suggestions for improvement. Thanks again! We really enjoyed our stay in Park City and this studio space. We were close to everything in town, and enjoyed the on property hot tub! The studio had everything you would need for a short or longer stay. It was nice to have the option to eat in for some meals as the kitchenette really provided all the cooking and dining utensils needed. We would definitely stay here again!